That’s how Kari Swanson describes the QPR method of handling mental health crises. If you know the process, she explained, you can save a life. The acronym QPR stands for Question, Persuade, Refer. And following those three steps, said Swanson, are the best way to prevent someone in crisis from attempting or completing suicide. Those trained in QPR are better able to recognize the signs of crisis, and to ask questions, persuade those in crisis to seek help, and refer them to appropriate resources. In the QPR method, “gatekeepers” are given specific training to recognize and act in cases of mental health crisis. These strategically-positioned people can be anyone in a person’s life. From teachers to parents to clergy to caseworkers to friends, supervisors, and doctors. Gatekeepers are anyone a person comes in contact with who are able to recognize signs of crisis. Like CPR, which is designed to stabilize people in medical crisis until the proper treatment team can get to them, QPR is a way to offer hope to someone considering suicide until they can be seen by proper care workers. The goal is to identify and interrupt a crisis. Swanson said that she’s gotten to train the teachers in the district in QPR, and the response has been overwhelmingly positive. One other change, on the district’s part, has helped them even more, Swanson said. The district went so far as to rewrite its policy on how students who report mental health crisis are handled. The person that a student initially discloses to is now able to follow the student through the chain of command as the disclosure is handled. This way, Swanson said, the person that the student initially felt comfortable enough to make a disclosure to can help act as a liaison between that student and all of the other people they will come into contact with. 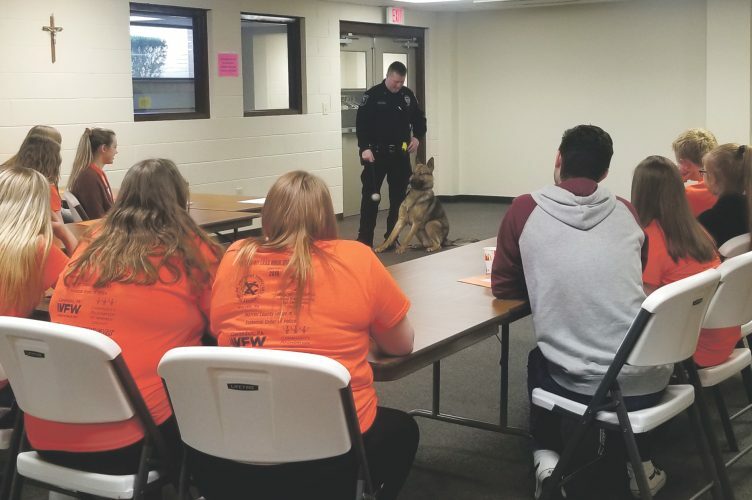 “We want to blanket the county with this knowledge,” said Swanson, adding that she’d like to make the training available to anyone who’s interested. She said that jail personnel, Department of Human Services employees and caseworkers, clergy, doctor’s offices, parents, and any other group who’s interested should call her to learn more about it, as she’s both passionate about the issue and ready to start trainings soon. But it doesn’t end with training those who aren’t suicidal to help those who are. Swanson said that the second part of her approach to this issue in the community is to start a support group for those who’ve been or are currently in crisis. “There are no other support groups” for the issue of mental health crisis in the community, said Swanson. And that needs to change. The idea is to create a community for what can feel like a very isolated group of people, who may not even know that others are dealing with the same issues they are. An attempted or completed suicide is not just one isolated, impulsive act. The behavior itself, explained Swanson, is impulsive. But the thoughts that lead up to it can be consuming, incessant, and build slowly over a long period of time. Being able to reach someone early on in that cognitive process, before they get to the point that they’re ready to attempt suicide, could have life saving results. When we do what seems most natural, socially, and suppress a struggle with suicidal ideation, said Swanson, nothing is being fixed. “We need to talk about it. We need to problem solve together,” said Swanson. That’s what she hopes this group will facilitate for those currently going through it. Swanson said that as soon as she’s able to gauge interest and has a group that’s interested in meeting, the group will be held at the First United Methodist Church in Warren. If, said Swanson, there is a need for flexibility or transportation, those needs will be dealt with. But for now, she said, all she needs is for anyone who might be even tangentially interested would reach out to her, she’d be able to get an idea of how to move the group forward. Because the group is not associated with the school district or with any particular agency in the county, said Swanson, there is no need to worry about school affiliation or need for insurance or payment. The group, said Swanson, is entirely free to attend and clear of any agency affiliations. The only requirement is that, Swanson said, “you just have to want to strengthen yourself.” Swanson added that at this point the group is focused on middle and high school students, but that if a need at the elementary level becomes apparent, she would be open to working that demographic in as well. She said that at some point in the future she thinks an adult group would also be beneficial to the community, but that for right now her plan is to focus on pre-teen and teenage community members. For more information on QPR training or the suicide support group, contact Kari Swanson by calling or texting (814) 779-0767, or emailing bkswanson@atlanticbb.net.